Come to High Strung on Friday 2/16 at 7:00 pm for a special House Show! 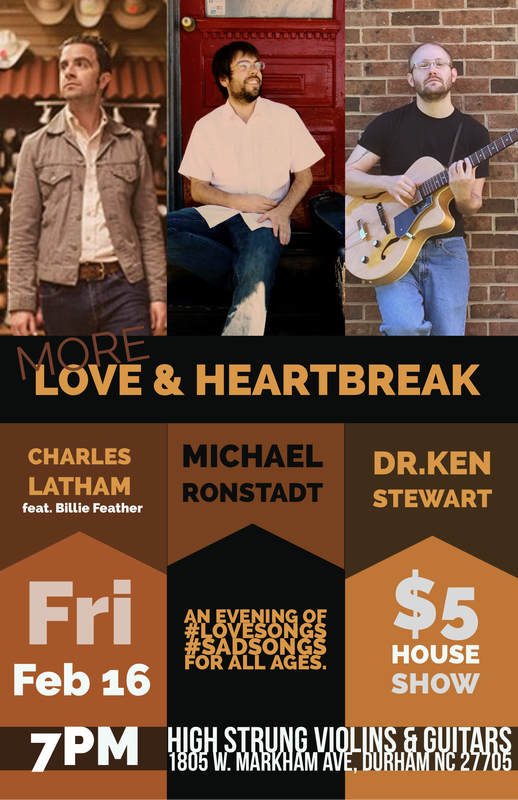 Four amazing performers will come together to offer "More Love & Heartbreak". The bill includes Dr. Ken Stewart, Michael Ronstadt, Charles Latham and features Billie Feather. If you are looking for a great show, THIS IS IT! Cost is $5. Click here to hear Charles Latham's music! Michael G. Ronstadt has been captivating audiences throughout North America for nearly two decades. He not only executes captivating solo performances, but participates regularly in duo and trio situations. Displaying genre-blending explorations on cello and guitar in complement to thought-provoking lyrics, Michael G. is a much sought-after studio musician, who has appeared on more than sixty albums in the last dozen years. A master at his craft, Ronstadt traverses a mélange of musical styles that range from anywhere between folk, jazz, classical, Americana and the wildly ethereal. Click here to hear Michael G. Ronstadt's music! Click here to hear Kenneth Stewart's music!